To begin, it's best to create characters when the creating character has 100 Mana or more, in order to boost the starting stats of the new character. This doesn't really apply earlier in the game, as you just want some characters to fill space and do some damage (and hopefully unlock more classes as they gain levels). Additionally, spend some money to buy some equipment (or use some equipment levelled up and modified (with the appropriate Specialists) for the purpose) for the new character to use in the process. Next, save the game and go through as many Promotion exams as possible with the character (saving between each exam in order to prevent losing any gained levels when the character inevitably fails an exam). After a handful of exams, it's time to head off to the item world for a quick trip through the character's lower levels. Choose an item you'd like to level up (or from which you'd like to retrieve some good residents). Statisticians (EXP) and Armsmasters (weapon mastery) are highly important to have when trying to level up characters, so they're also good to go looking for when leveling up earlier in the game. Save the game before entering in case you encounter a problem early on, as quitting and restarting the Item World for that item may be more beneficial than exiting (since the Item World is random, things will be different when reloading the game from a save prior to entering the item). Certain locations in the main story (Etna Mode Included) are pre-designed for levelling up characters. Note that this list does NOT include the Bonus Maps. Those are covered further down the page. Episode 4-1: This map has EXP+100% Effects across all of the panels here. Throwing the Scarecrows standing by the Base Panel into each other will create an enemy way beyond your level. (Level 36 if you combine all 4 Scarecrows) However, since this enemy is ill-equipped, they won't be that much stronger in terms of defense and can still be damaged properly as long as your current offensive stat is at least 150 or more. Having a character cast Braveheart and/or Magic Boost makes this easier. (Of course, should the attack you choose to use fail to kill the overpowered enemy, have an ally lift them up so your character doesn't get killed) One can also combine the Dark Knight and it's bodyguards further down the map if necessary, increasing the overall EXP Gain for the character in question. Using this trick is good for amassing Mana quickly early on. Use of this Trick allows for possible early Transmigrations; making some of the Later Episodes easier, as your characters will be more able to properly defend themselves; and you will be able to unlock most of the secret classes more quickly than a common play-through would. A small flaw with this trick involves the enemies' DEF and RES. The coding that creates the enemy's stats before the map starts may occasionally grant them DEF and/or RES outputs that they simply should not have at that time. Keep this in mind when leveling Gun-toting or Magic using characters. This flaw is especially devastating towards Magic-users, as RES seems to be the stat most affected by this glitch. Having spells that target the enemy's weakness will NOT alleviate this glitch. Episode 9-1: Upon revisiting this map, it will be occupied by 9 Kit Kats in a 3x3 formation. While it has no EXP bonuses like 4-1 had, it is still a good map to level newly created troops, since they will no doubt have access to stronger weapons by this time. Magic-users should stick to using Star magic for this map, as Resistances ignored may leave enemies standing. Moves such as Winged Slayer, Asteroid Drop, and Lion's Roar can clear this map in one to two turns. Episode 14-1 (Revisit Only): Upon revisiting this map, Mid-Boss will be gone, but the Nosferatus that aided him will remain. 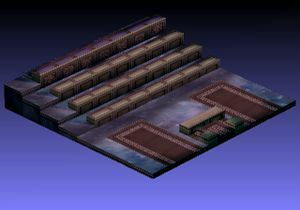 Plus, this map will have EXP+100% on all available panels, making this the best leveling site in the main story. Upon getting stronger weapons, one can even combine the Nosferatus together to make grinding go by faster; speeding up any Transmigration plans the player may have. Again, Star Magic is recommended when leveling Magic-users. Etna Mode Episode 3-2: This map has EXP+100% effects on every green panel....And on every green Panel lies a Treant. While the Treants are in formations that very few multi-target attacks can accurately target, it still remains a decent grinding map until the Cave of Ordeals in unlocked. Skills that move enemy characters are of vital importance when trying to get through levels in the Item World. When trying to level new characters, check each level for experience bonuses and just skip them if possible when the experience bonuses aren't there or can't be received (for example, if you can't get enough of a geo chain bonus to acquire the experience bonus). Run (or throw characters) across the level and move the Gatekeeper with one of the listed skills to get through it with as little interaction with the level's enemies as possible. When an experience bonus is found, bring out the characters that need experience before the last enemy goes down (if the geo chain is likely to kill all of the enemies and there are safe points, bring the characters out to safe points before setting off the chain). Kill the last enemy with the experienced characters (or give the new character a strong weapon and let him/her take the finishing blow, if possible) and reap the rewards of the bonus. When the newly-levelled character has enough mana, transmigrate (to the next class tier up if available) and start again. 175 Mana is generally best early on, as this gives the "Average" option in the transmigration. Transmigration returns the character to level 1, but you get the chance for a significant bonus to the character's starting stats, as well as the chance to change their class (which can also boost their stats). Story characters can also be transmigrated, though they can't change class. Later on in the game, it's more important to use the higher level transmigrations that require more mana (and possibly Assembly approval), as these give higher bonuses for the starting stats. Once your characters and equipment are at a high enough level, make your way back to the Cave of Ordeals in Etna mode, where the enemy levels will be higher. Cave of Ordeals 3 and Demonhall Mirror, once unlocked, are excellent maps for gaining the most possible experience in the shortest amount of time. With well-developed weapons (with high level Statisticians) and "Make Enemies Stronger" bills, CoO3 becomes a great place to level to 2000, and Demonhall Mirror can take the characters to 8000. Keep in mind however that the Demonhall Mirror is unavailable in Etna Mode! This page was last edited on 8 May 2012, at 00:39. This page has been accessed 71,078 times.